What difficulties are the lead free rhinestones faced with now? 1.During the process of manufacturing the artificial crystals, it needs to use the lead metal, which will do harm to the human health, but it is the key element to make the rhinestone shining, so this is what the biggest difficulty is. However, after our factory’s hard working for years, this difficulty is solved perfectly! Our SWAINSTONE Rhinestone’s lead content could be less than 10ppm, even be none, while the stone is still very shinning. 2.For the special colors such as pink and rose, because of the high-cost lead free material, the price will be a little bit higher. 3.The colors of siam, orange and black diamond normally have the problem of over cadmium content. 4. Most of factories, wholesalers, distributors will have the lead-free test problem, since they could only do the lead-free test by the third party like SGS, ITS, BV...etc, they could not take the control of the whole production process, which will cost a lot and take rather long time, perhaps as long as 15 days to get the test result. 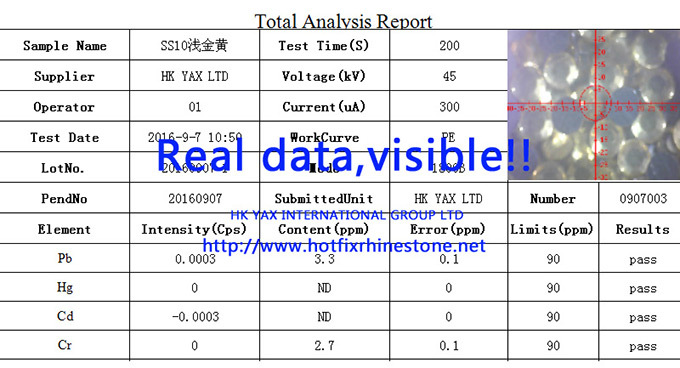 In this industry, only we HK YAX owns the test machine, could take the control of the lead-free production process, and provide the clients with the lead-free rhinestone test for FREE, and normally it will take only 1-2 hours to get the report.